British Armed Forces around the world rely on British Forces Broadcasting Service (BFBS) to provide them with entertainment and information via their TVs and radios. Operating from studios in Buckinghamshire, BFBS is part of Services Sound and Vision Corporation (SSVC), a not-for-profit charitable organization that makes a considerable contribution to maintaining the efficiency and morale of Britain's Army, Royal Navy and Royal Air Force. BFBS delivers the best of UK television and radio around the clock, with fifteen live 24-hour TV channels broadcast via encrypted satellite and online to an audience of 25,000 in 24 countries and to Royal Navy ships at sea. The service iis unique in that it runs the entire end-to-end television system, including ingest, production, playout and distribution platforms right through to viewer's receiving equipment. It also manages all the TV viewing cards, runs a 24 hour Forces TV news channel, 20 radio stations worldwide and even has its own DVD duplication to cater for armed forces who need entertainment beyond the reach of satellites. BFBS aims to give viewers access to the same extensive choice of TV programming they would enjoy back home with premium content as well as popular television programmes. In 2013, BFBS was awarded a new 10-year contract from the Ministry of Defence and at that point it decided to revisited its entire technology strategy and undertake an ambitious modernization plan to refresh its 10-year-old TV playout facility, originally installed during the shift from analogue to digital file-based operations. Working closely with leading UK-based systems integrator dB Broadcast to overhaul its well-used systems and migrate operations, BFBS has now transitioned from a labour-intensive workflow using a mix of tape and file-based equipment to a new efficient streamlined operation fit for the next decade. Hunter Adair, Head of Technology Service, Television and News at BFBS/SSVC explains, "Our workflow is unlike any other broadcaster because of our unique operation. BFBS turns around hundreds of hours of content each week ingested from over 40 UK TV channels. It then schedules, edits and presents this extraordinary volume of content with very quick turnaround using just a small team of talented staff. Our challenge is always to do more for less and to optimize our multi-skilled resources, so we looked to employ broadcast chain virtualization to let us to move to a one-operator workflow and drive performance and efficiency." The workflow defined and delivered by dB Broadcast features SAM ICE channel-in-a-box with Morpheus automation, a Provys traffic system and IPV's Curator Media Asset Management based on Cisco hardware, Axon Synapse signal processing, Arbor mass ingest recording and NetApp storage. 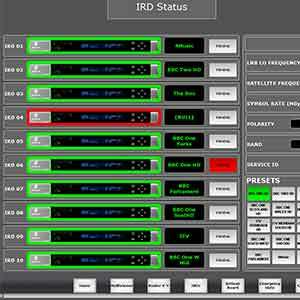 At the heart of the system sits Axon's Cerebrum providing advanced control and monitoring across the entire BFBS broadcast chain. "Axon is a respected supplier of premium infrastructure and, over the years, dB has developed a close working relationship with the team - appreciating both its technical expertise and quality customer support," said Tom Swan, Sales and Marketing Director at dB Broadcast. "Cerebrum was the natural choice for this project, delivering both reliability and scalability. Collaborating together, we have developed a single control panel with a customized user interface to efficiently view the entire BFBS transmission workflow." Six months on from the launch of the new facilities in Chalfont, BFBS is reaping the rewards of deploying Cerebrum and of a more efficient operational workflow. Adair concludes, "Cerebrum provides us with a holistic customized view of our operations and gives us greater flexibility to scale and adapt in this fast-moving environment. We are happily satisfied with both the total cost of ownership of the system and with Axon's support, which has enabled us to efficiently perform on a daily basis. Cerebrum certainly helps us to fulfil the BFBS mission, which is 'To Serve Those Who Serve'." From Axon's point of view, our product philosophy has always been to provide forward-thinking technologies that anticipate and satisfy the needs of customers - to save time, mitigate risks, reduce capital and operational costs and ultimately to deliver competitive advantage. We are delighted that Cerebrum was chosen for such a prestigious project and feel confident that it will continue to deliver efficiencies for BFBS well into the future.